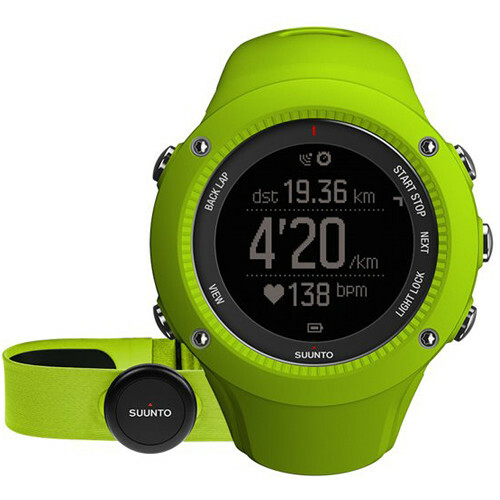 Get comprehensive run statistics with the lime Ambit3 Run Sport Watch from Suunto. This Bluetooth-enabled watch provides real-time speed, pace, distance, and cadence data. Additionally, the Ambit3 works with the included Smart Sensor heart rate monitor to deliver more advanced running metrics and features, including real-time heart rate data and calories burned measurement, giving you the data you need to be a better and more efficient runner. In addition to running data, the Ambit3 also tracks specific cycling, swimming, and general activity data. It's even equipped with a digital compass and GPS sensor for outdoor navigation and exploration. The Ambit3 enables you to share all your sport and outdoor data and to monitor your progress at the Suunto Movescount sport community. Using the free Movescount app, you can visually enrich, relive, and share your exercise data and adventures instantly to your social media networks. The Ambit3's rechargeable lithium-ion battery lasts 15 hours in 5-second GPS accuracy mode and up to 14 days in watch mode. Additionally, the Ambit3 is designed to be water resistant up to 164', so you can take it with you in the pool or out into the rain. Box Dimensions (LxWxH) 5.1 x 3.7 x 3.6"